Session Road | Commercial Center of Baguio City | Go Baguio! 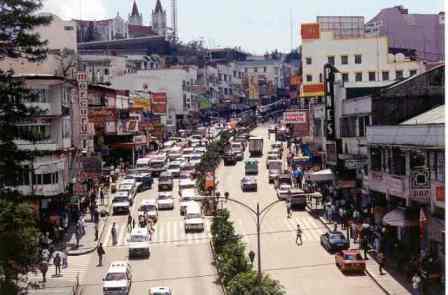 Session Road is the main thoroughfare of Baguio City and its commercial center, with a variety of shops, stores and offices lining each side. 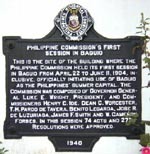 Session Road is so named because it was the site of the Philippine Commission's first session. A lovely walk down from Luneta Hill toward the Baguio City Market, Session Road is where you will find department stores, bazaars, boutiques, old movie theaters, hotels, cafes and restaurants, bakeries and grocery stores. A majority of banks operating in the Baguio City are found there, as well as various offices, drugstores, book stores and news stands. tourists and visitors to the city taking a leisurely stroll up and downhill, window shopping, meeting up with friends, snacking on ice cream in cones bought along storefronts that open up to the sidewalk, or stepping into many of the restaurants lining the street. Due to its slope, and the mid-20th century American-town inspired facades, some Art Deco buildings, and a variety of offerings along the way, Session Road is a promenade distinct from other commercial centers in cities and towns in the Philippines. Add to this the terrifically cool Baguio weather and friendly locals, and a stroll through Session Road is a totally different experience altogether. Site of the First Session of the Second Philippine Commission. Session Road leads up to the old Baden-Powell Hall, where the second Philippine Commission held its sessions from April 22 to June 11, 1904 and officially initiated the use of Baguio as the Philippine Summer Capital. A marker by what is now Baden-Powell Inn on Governor Pack Road, stands as "the only visible evidence that anything of historical significance ever took place on Session Road." 1901, that held its sessions in Baguio City. Session Road is divided in two sections: Upper Session Road & Lower Session Road, although the latter part is that which most visitors are familiar with because it is the where most commercial establishments are located, and no one calls it "Lower Session Road" really. We simply call it Session Road. This part runs from the intersection on Magsaysay Avenue upward towards Baguio Cathedral (Father Carlu St. on Mt Mary Hill) and Governor Pack Road while Upper Session Road starts from the Post Office and the foot of Luneta Hill (where Pines Hotel used to be and which is now SM City Baguio) all the way to the rotunda of South Drive, Military Cut-off Road and Loakan Road (where the old Main Gate of Camp John Hay used to be). The most expensive of all Baguio real estate. We are talking here of the "primest" of prime property in Baguio City. Due to its central location, the volume of pedestrian traffic, a limited number of commercial spots for rent and very few properties being put up for sale in the market, Session Road real estate commands a pretty steep rate. Folks who want to do business there usually have to pay the previous occupant what they call "rights," usually a fee in the hundreds of thousands, if not millions of Philippine pesos, to be able to take over the spot. This fee is on top of the premium rental rates being charged by lessors. Starting point of all Baguio parades. In the early years of the Panagbenga, when it was still organized by the folks connected with Camp John Hay and the John Jay Poro Point Development Corporation, the Baguio Flower Festival parades used to start from Upper Session Road, descending towards Magsaysay Avenue and turning to Harrison Road and ending up at the Athletic Bowl at Burnham Park. Nowadays, the parades start from the base of Luneta Hill where crowds, well, "crowd" along the sidewalks, office windows and balconies to get a glimpse of the festivities. Session Road is favored for parades due to its slope affording spectators a fabulous view of the streetdancers, bands and floats. The most direct route to anywhere in Baguio City. Session Road's central location is what causes it to be most congested with motor vehicles and pedestrians because it connects to major roads like Leonard Wood (all the way up to Mines View Park passing through major Baguio tourist attractions), Loakan Road leading toward the Camp John Hay Main Gate, and Magsaysay Avenue (Baguio City Market all the way to La Trinidad Valley). Session Road runs perpendicular to Harrison Road (Burnham Park) and has several side roads leading to that other major avenue. Philippine Commission marker on Gov. Pack Road near the corner of Session Road. Read the full text at the History of Baguio City.